VMWare make their vSphere Hypervisor free to download and use which is an amazing deal, they also offer a free evaluation of VMWare vSphere which adds extra bells and whistles for enterprise level virtualisation. If you take the evaluation version, you have 60 days until the vSphere client locks down and stops you powering on your virtual machines. At that point, you will either have to pay for a full vSphere licence, or downgrade to the free version again. Of course, they haven't made it very easy to find out how to do the downgrade! If your evaluation has expired, your vSphere client should look something like this. To downgrade to the free version and regain control of your virtual machines, you need to get a new licence number - its free. I have heard reports that the licence key would have been sent to you in the initial email which you received from VMWare when you registered for the evaluation, but I couldn't find it in any of the emails I had received. The best bet is probably to go ahead and re-register at the download page for ESXi - From the VMWare home page, open the 'Products' menu and choose VMware vSphere Hypervisor (ESXi) then click the download button on the left side. Login, or hit the continue button and fill out your information. Once you have completed the registration process you should receive an email with an 'Activate your VMware ESXi 4.1�License' link. Click that and you should be presented with your new license number. Copy the license number and go into your vSphere client. 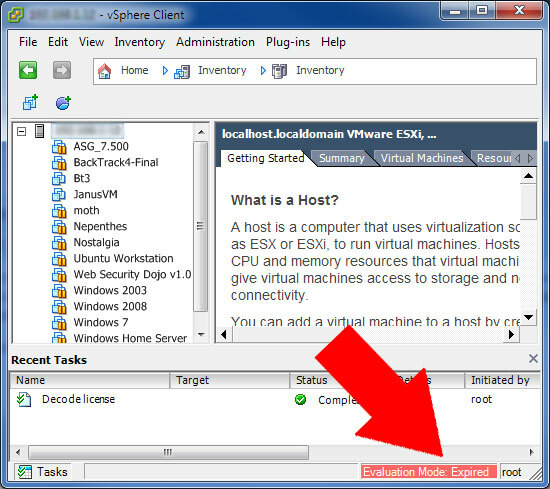 At the top of the list of virtual machines, highlight your host machine. Go to the configuration tab and choose 'Licensed Features' under the software section. Click the small 'edit' link at the top right corner. 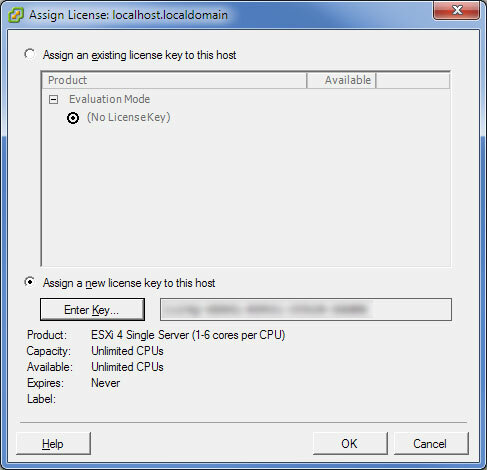 You should now see your current evaluation license with no license key. Click the 'Assign a new license to this host' radio button, click the 'Enter Key' button and paste in your new license number. You should now be able to administer your virtual servers as before. I'm yet to find out what features are missing from the free version compared to the full vSphere version. Let me know if this works for you! lesault: You're very welcome - glad it helped! Paul: Wow. Thank you for posting this. VMWare was little if no help in this matter, I was continuously redirected to my account with instructions on how to obtain my code but NEVER where to put it. Even their youtube instructional made it seem like this could not be done. THANK YOU! lesault: Thanks Catherine - I thoroughly enjoyed your blog too - I'll be a regular visitor. Shahryar: Thanks. you are a savior. Jim: Did not work for me. They must have taken this feature away. All I get is invalid license file. Charles W: I searched high and low for the solution to this. Thanks. raul Mendez: Great post, very useful!! gustavo: Hi, and thanks for your post. One question remains , though.... I am using ESXi 5, for a few days, for personal use only on a very humble laptop. When i entered the license key, i got the same license screenshot as you which says : "Expires: Never" So, what gives? I have to re-enter the license key every 60 days or so? That "never", it puzzles me. Thanks, for your answer ! Best regards.